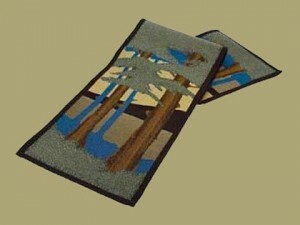 Table Runner with Landscape design based on the popular Motawi tile. Poly/acrylic/cotton blend. Machine wash cool. Dry clean for best results. Measures approximately 13" x 54". Coordinating placemats, pillow, and throw are also available. Made in the USA.